Let me tell you, we had so much fun. At my IRL party and our little Twitter party. I was happy with almost all of the winners, the dresses were gorgeous, and I thought Seth Macfarlane did a fantastic job. We laughed our butts off. And we needed to, because we ate SO much good food. Where there is good food and chilled wine, you will find the three of us. 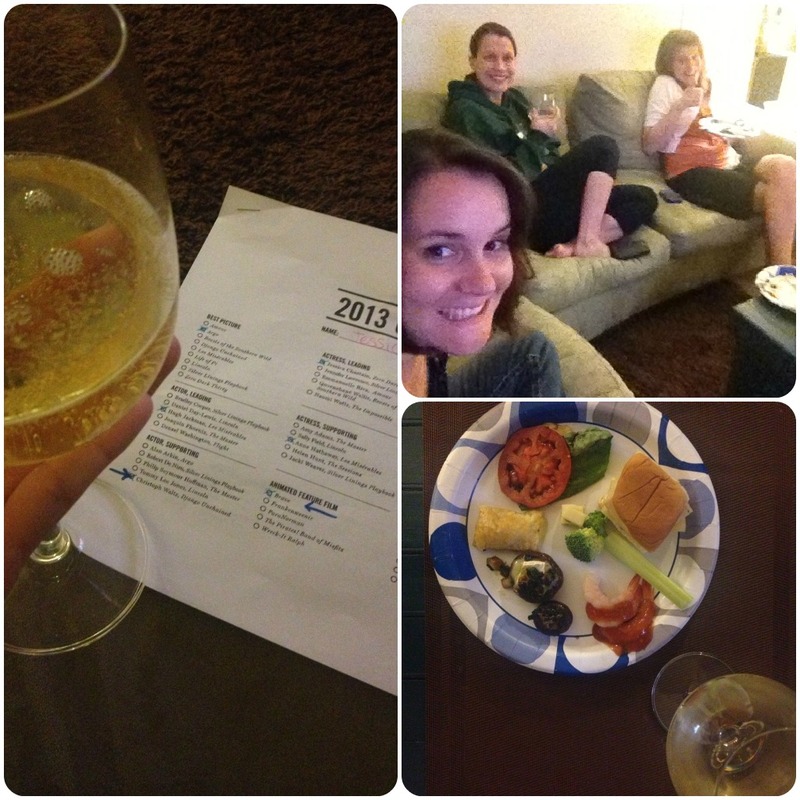 I love that this is our second year watching the Oscars together, and I wish we could do it again next year, but the Army is cruel. Anyway, look at that plate! Caprese salad, shrimp cocktail, avocado-stuffed pastry, brie stuffed mushrooms and something call the "ex-girlfriend sandwich". (long story) I was stuffed and tipsy the whole night through. Mary even printed off a ballot we could all mark our predictions on. Fun, fun, fun night! Thanks for not bringing up my weird face. Gotta love that Megan joined us after her morning gym routine in KOREA! Jen from That's What She Read...hilarious. “@sweetgtangerine: Watching the Red Carpet! #sgtOscarsParty Who's with me?” You know I am, girl!!! @twsrblog @take2review that's awesome! Welcome mom! As for the show, I didn't do too bad on my predictions. My favorite winners of the night were definitely Christoph Waltz and Jennifer Lawrence. To be honest, I predicted Jessica Chastain, but I was ecstatic when JLaw won. I feel like she took a hit to her serious acting career when she took on the Katniss role, so as a HUGE fan of her work and The Hunger Games, I'm grateful and glad she won. I was disappointed that Beasts of the Southern Wild didn't take anything home. They don't need awards though...they rocked the Indie Film fests. I was bummed that Hugh Jackman didn't beat Daniel Day-Lewis. I'd like a rematch, and this time DDL has to sing live the entire time. Okay, I admit, he could probably still pull it off. But I do want to talk him out of that little boy haircut from now on. The photo doesn't show the necklace well, but I loved that simple touch. The color was gorgeous and the unique, bold skirt was breathtaking. I hate to say it, but this dress...shake my head. What was she thinking? And the flowery necklace was a little juvenile. I couldn't stand any of this look at all. It didn't take long for #AnneHathawaysNipples to trend on Twitter. Elle from Wishin' Good Luck!! Great recap! What WAS ann thinking with that dress?! I have to say Jessica Chastain was one of my favorites, she look amazing. Jlaw was best dressed to me. Amanda Seyfried would've been up there if the top of that dress was fitted better. Hugh was the best part of Les Mis for sure but though I've only seen a small bit of Lincoln, Daniel Day-Lewis WAS the character. I know the movie itself isn't great at all but neither was Les Mis so maybe that's why I give this one to DDL.